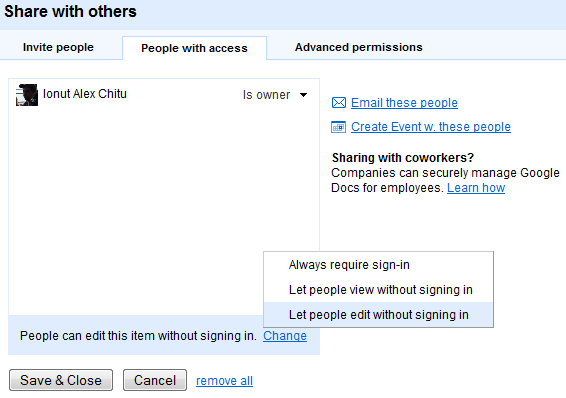 One of the big changes from last week's Google Docs update is that the sharing features are more consistent. For example, you can now publish a PDF file by clicking on "Share", selecting "Get the link to share" and checking "Allow anyone with the link to view (no sign-in required)". While the file becomes publicly available, you still need to log in using a Google Account, despite Google's claim that no sign-in is required. Until now, spreadsheets had an unique feature that allowed you to collaborate with anyone that received the link to the spreadsheet, without even having to log in. The feature is now available for documents and presentations, so it's easier to collaborate with many people. 1. Read some Gmail tips from Google in a published PDF file. 2. What do you expect to see in Google Chrome OS? Collaborate on a Google Docs document and share your thoughts. Re: 2. What do you expect to see in Google Chrome OS? @imma: I can save, and it says "saved on ... by guest"
What do they mean with "edit" PDF-files? As now no one can edit PDF's in Google Docs. And it's not really publishing a PDF, it's sharing according to Google's terminology. For spreadsheets, presentations and documents you can choose "publish as a webpage" from the save-menu. But after that they have different user interface and different public URL's system. And some really old bugs still exist. I can't delete/remove shared spreadsheets that someone else has shared to everyone. A new bug is that even if documents is shared, it doesn't say so in the Docs List ("Explorer file list"). So watch out what files is public for all or not. "No sign-in required" for PDF is simply wrong and should be removed or fixed. IMHO they're just using the same interface made for documents and spreadsheets, which can be shared without sign-in in read-only mode, or published as web pages. Also, "edit" makes little sense for PDF files. Google should pay more attention to details like this, the user interface sometimes doesn't look very polished. you can publish documents and spreadsheets as web pages. But while for documents there's a Publish command under the More Actions menu, in order to publish a spreadsheet you need to open it and go to the Share drop-down menu. Why these inconsistencies? It's not very nice that shared doc, it would need some kind of structure I guess, otherwise is just like a chat or splattered comments and doesn't make a sense as a document. At least you can just grab the link instead of having to send an invite to yourself and get it from there. @KMB "What do they mean with "edit" PDF-files?" @ArgiaSbolenfi "Also, "edit" makes little sense for PDF files." When only "Allow anyone with the link to view (no sign-in required)" is set you can't use any of the options on the Share menu of the PDF. When also "Also allow them to edit" is set you als get the option 'See who has access' and even more if the owner of the shared PDF ticked Advanced option while sharing (in either the Invite people or See who has access menu options), i.e you get the option that allows you to invite others to the spreadsheet like a collaborator/editor to a Google Docs spreadsheet of document would get. In other words "Also allow them to edit" actually means 'Also give them collaborator/editor status'; the people at Google however favour simple sentences for us simple users, even when these are more ambiguous or simply vague. I agree that PDF should allow to be published, but this may mean they would have to be rendered as web pages, much like Google would allow /view as HTML/ for many PDFs that are the result of a web search - just to be consistent with how documents and spreadsheets are published. The issue by which people are forced to log in into a Google account even when sharing explicitely states that a sign in is not required is a bug and is considered such by the Google Docs Guides. The problem seems to be browser related, and Google is looking for a permanent fix because not only PDFs but also spreadsheets seemed to be affected by this bug. btw. I wish to work also with some WYSIWIM editor (like lyx) with diff highlighting, bibtex features, etc instead retired WYSIWIG in my google docs. No sign in required any more, it seems. Open the PDF file, click on "Share", select "Get the link to share" and click on "Allow anyone to view the document". It's not exactly a way to publish PDF files, but it's the best way to make a PDF file public. 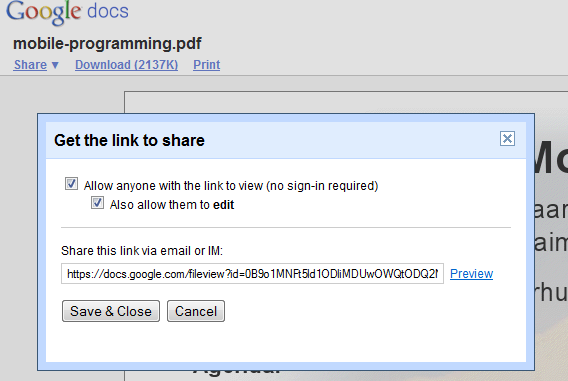 It would be very nice to be able to add comments to Google Docs Shared PDF files. I find the need to share a lot of PDFs, but I'd like to give an easy way for people to write their corrections/comments/suggestions &c right on the google doc. I would like PDF be published similar web-view for documents and spreadsheets, i.e. no login would be required and PDF was displayed as a web page. I used scribed until I found that it simply doesn't give facebook preview (on the news-feed). I found out about http://share.kagoon.com which publishes any document in 4-clicks and it works for me. Google workd fine right now, I also use dropbox for my document viewing.